I took Julia in to Boston for blood work today. It was pretty easy, as usual. No major traffic headaches, just in and out. The weekend on-call phlebotomy staff is starting to get to recognize Julia, I think. Not sure if that's good or bad. After that, Julia and I went out to a nice lunch and then did a little shopping at the bookstore. Tonight, we went to a Valentine's Day dance that was sponsored by Julia's school. The music was too loud (or maybe I'm getting old, none of the kids were complaining! ), but everyone had a great time and it's a great chance to connect with the other parents (if you don't mind shouting all the time). Julia is looking great, her rash is all but gone, and she fits into a nice red dress that she couldn't fit into a few months ago. Julia basically spent the morning at church today. We went to 8:30 mass together because both me and Julia's mom were "on" (I as a reader and mom as a eucharastic minister). At the end of mass, we all had our throats blessed. Than Julia has children's choir practice, and then the has to stay for the 10:30 mass where she sang a solo. At the end of mass (which ran rather late), Julia got her throat blessed again, and then we celebrated the community Sacrament of the Sick. Julia ended up spending almost 4 hours there. After all that, we all had stuff to do around the house, and then we settled in to watch some movies in the evening. Late today, Dr. A.W. emailed us back all the results of Saturday's blood work except for the von Willebrands. The raw results are: CK 73, LDH 212, AST 28, , ALT 24, aldolase 4.7, albumin 4.1, white blood cells 4.79, Hematocrit 37.5, and platelets 390. Everything is still normal! We will wait for the vW result before changing the meds. The von Willebrands test result came back today, and it was also normal, at 91. This means we can reduce Julia's MTX to 20 mg (0.8ml) per week, starting tomorrow. This brings us one step closer to stopping the injections altogether! We don't have any 20mg syringes of MTX, so we are using the 22.5m syringes and injecting 0.8ml instead of 0.9ml. Tonight, we got a visit from a nurse who works for the company that now sends us our Methotrexate. This was a formality - they needed some release forms signed in the presence of someone from the company. They were also going to show us how to actually do the injections, but we are experts - we've been doing these for about a year and a half. That would be about 40 injections for each of us! Obviously, she didn't need to show us how to do anything. However, she did take Julia's blood pressure (100/60), temperature (98.6°F), and pulse (82). We signed all the papers and explained a little about JDMS to her. She had never heard of it (surprise, surprise!). We showed her the Gottron's Sign on Julia's hands, and the color of the rash on her eyelids. I'm happy to say that those ore the only symptoms she has now! It's great. We went through all the drugs and supplements that Julia is taking - she'd never heard of Quinacrine either. She was very friendly and personable. We now hafve a packet of signed release forms for our files. Wo got a coating of snow this evening, and the nurse had a bit of trouble getting up our somewhat steep driveway. I had to salt and sand the driveway, and then I drove her car up the hill. I think it may need new tires. Julia had an all-afternoon retreat at our church today. This is part of the preparation for her first celebration of the Sacrament of Reconciliation. This is the first time she's has to really participate in something with the rest of her "classmates", since we've been home-schooling her on the Sacrament because CCD is at the same time as her dance lessons. She said it was a good afternoon, but a little slow for her liking. The regular 5:00 Saturday mass was also part of the retreat, and we were there for that. When I dropped her off, some of the other parents commented on how good Julia's skin looks. 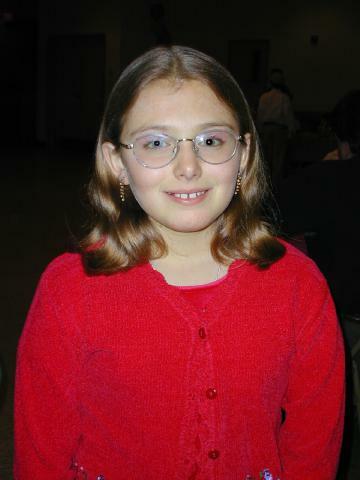 A lot of them remember how Julia looked 2 years ago when she received the Eucharist for the first time. We do know her skin is looking good, but it's always nice to have independant confirmation of it. I asked all our online Myositis friends to send Julia an online birthday greeting for her special day tomorrow. They certainly responded! Julia got a total of about 50 greetings. Thanks, everyone! She enjoyed reading every single one. 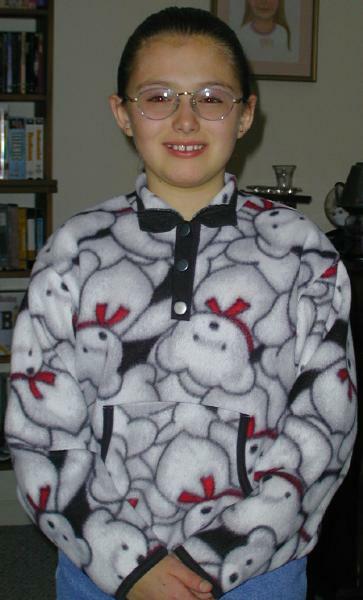 Happy 10th Birthday, Julia!!! I ran across an interesting coincidence. Kurt Vonnegut published his latest, and reportedly his last, book in 1997, Timequake. In Timequake everyone must live the decade between February 17, 1991 & February 17, 2001 over again. Hey, that's today!! Strange. 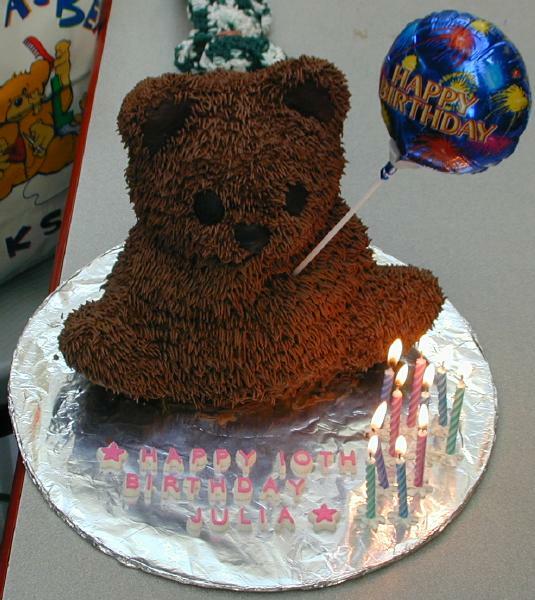 Yes, today is Julia's tenth birthday. 10 is one of the more symbolically important birthdays - double digits, looming teenage, etc. All three of us decided months ago that she would have a smallish party at the Build-A-Bear Workshop. She's been to BABW once before - you may recall the bear that got lost in Florida last December was from BABW. We checked out their web site and found they do parties so we booked it early. Because of the relatively high cost, we told Julia she could invite up to 8 friends. This worked out well - she really only had 7 friends she really wanted to invite anyway, and unfortunately one couldn't come because the family was traveling. That meant a total of 7 kids at our party. We were scheduled to start at 11:00, and everyone was there by 11:05 - except one boy. A few minutes later, we got a message from the staff. It turns out they went to the wrong BABW in another mall an hour away! The show had to go on - the 6 other kids would start the bear-building process and the straggler would have to catch up. This BABW concept is a lot of fun for the kids. We put a dollar limit on each of the kids' bears because they can really go wild (and expensive) with the accessories. First, they select an animal they want to build - there are lots of bears, of course, but there are also cats, dogs, and other animals to choose from. All the kids in our party took a bear. They can implant a sound module, like a voice or a heartbeat that plays when a contact switch is pressed. Then they stuff the bear - it get packed with shredded polyester fibers. A staffer does the actual stuffing, but the kids control the process with a foot switch and can determine how hard or soft they want the bear to be. Each bear is given a little cloth heart to stuff inside, and also a shamrock if they wanted. Finally, the staffer sews up the bear and then the kids can go dress it. They carry a wide selection of clothes and accessories for the bears - outfits, glasses, hats, shoes, and lots more. 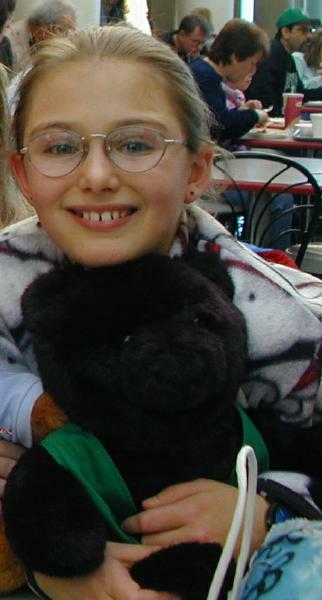 Julia picked a simple green vest for her black bear. One girl picked angel wings for her white bear, and one boy dressed his bear like Steve Irwin, The Crocodile Hunter on TV. Very cute! After they were all dressed, the kids go to computers where their bears are "registered" (and marketing information is collected :-( ), and a birth certificate is printed and sent to the checkout area. Finally, the bears were packaged in a box. Just as we started the checkout procedure, the missing boy arrived! 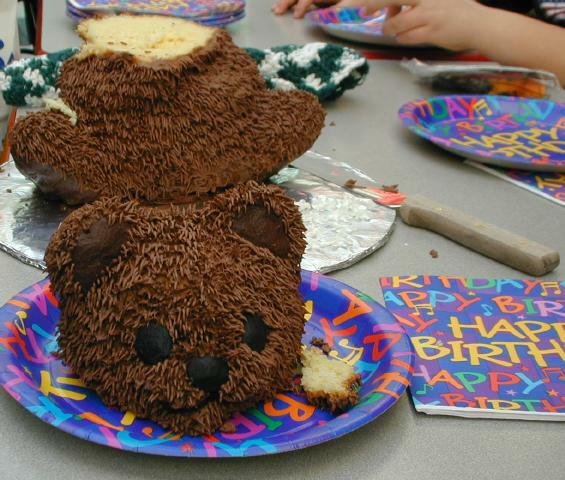 The capable and amiable staff whisked him through the bear selection, stuffing, and dressing process and he had just caught up with us as we were about to make our way to have some lunch and birthday cake, and open presents. The BABW experience was a lot of fun and the kids all loved it - and naturally, you don't have to worry about party favors for the kids. After the BABW, we trudged up to Food Court and had lunch at Arby's. One of the moms graciously agrees to come up here and reserve us a few tables for the party. The staff at this Arby's really tried hard, and we appreciated it. They hustled the kids meals in short order, and everyone was soon enjoying their food. ...when suddenly, the fire alarm started sounding! A couple of the girls in our party started to panic and get all excited about it. This, of course, infected the rest of the kids with more worry and panic. After about 5 minutes of continuous sounding, we decided to pack up and leave the mall. We got all our stuff, made it down the first set of escalators, and just as suddenly the fire alarm stopped! We immediately turned around and headed back to our spot and resumed the party. The alarm sounded twice more for about 30 seconds. Each time, the girls would again start a wave of anxiety and panic. This was not your typical birthday party lunch! After lunch, we served birthday cake. Julia's mom spent *hours* yesterday baking and decorating this masterpiece of a cake. It was in the shape of a bear sitting up and holding a miniature "Happy Birthday" balloon. It was truly a work of art - nice job, mom! Everyone loved seeing the cake. Julia had a good time beheading the cake and then slicing the head to distribute to the other kids. After cake, Julia opened presents. She got a couple of gift certificates, and some of the art & craft kits that she is so fond of. She was very pleased with the presents she got. It seemed like a good time was had by all! Here are a few pictures - click on the thumbnails for a larger image. This is President's Day, and the start of Julia's school vacation. This was a pretty laid-back day at home. We also don't have much planned for her this week. She is working an a science project that is due next week and wants to have as much of it done as possible before school starts up again. Julia woke up once in the middle of the night last night coughing. We gave her a half a cough pill and she was fine after that. She did do some coughing during the day also. Hopefully, this won't turn into anything worse. Julia slept all right last night, but we did give her a cough pill at bedtime. She was hacking a lot more today during the day. She doesn't seem to be having any significant symptoms beyond the cough, i.e., no fever, no sneezing. Ugh. Julia had a miserable night last night. She was coughing at bedtime and had a tough time falling asleep. Then she woke up several times during the night coughing some more. She was not in a good mood this morning. On top of that, she was stressing about her science project. It's almost done, but not quite and she's worried about that. Julia took a cough pill at bedtime last night, and needed another at about 2:00 AM, but otherwise slept very well and woke up feeling a lot better. It never does cease to amaze me how well she bounces back from little illnesses.